A key factor driving the growth of the global car wax market is that car waxing has become an essential part of car maintenance services, as it provides protection as well as maintains a showroom-like finish of the car, which is a crucial factor in enhancing the resale value. For instance, it is expected that professional detailing can boost the resale value of the vehicle by about 15%. Hence, more and more customers prefer car waxing as most buyers of these vehicles are very particular about maintaining their vehicles, which encourages them to use car wax to keep the vehicles in a gleaming condition. Additionally, many market vendors are manufacturing and selling premium-grade car wax to achieve a rich shine and increase profits. Thus, such factors are expected to drive the growth of the market during the forecast period. This global car wax market research report also analyzes other important trends and market drivers that will affect market growth during 2019-2023. The developments in car wax is not just restricted to its form; some vendors are targeting super-rich customers who buy luxury vehicles by developing luxury-grade car wax. The luxury car wax offered by several vendors give a golden shimmer and can protect the car for up to four months. Additionally, the demand for this luxury car wax is very high among luxury cars manufactured by OEMs such as Porsche SA, Rolls Royce SA, and others. These vendors are also offering various types of car wax in their product portfolio, wherein it provides a varied result, from a high gloss finish for a classic car to a durable protector for a four-wheel drive. "The demand for luxury-grade wax mostly arises from high-net-worth individuals. High-net-worth individuals play a significant role in elevating the demand for luxury vehicles, especially super-luxury cars. 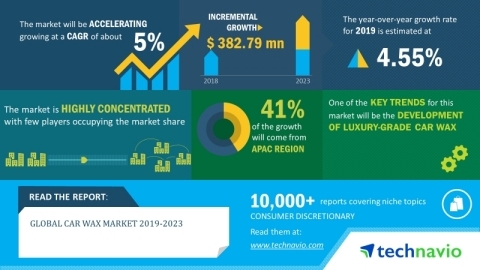 Therefore, the significant growth in the luxury vehicle market will result in the growth of the luxury-grade car wax segment," says a senior analyst at Technavio. This market research report segments the global car wax market by type (synthetic wax and natural wax) and geographical regions (North America, Europe, APAC, South America, and MEA). The North American region led the market in 2018, followed by Europe, APAC, South America, and MEA, respectively. However, during the forecast period, the APAC region is expected to register the highest incremental growth of over 5%.